I have taken many walks around the Cummings Center pond this summer, and have taken many photos there. 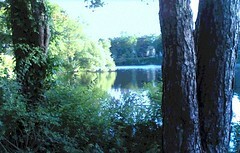 This photo shows one of my favorite views, the water seen through the trees. Today I opened this image in Painter IX and used a light color overlay on the sky and water. I also posterized the image. The pond is beautiful in the summer light, but I am already looking forward to fall and seeing how the pond looks as the leaves begin to change color. 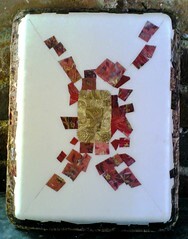 This is a collaged design I am making on the back of styrofoam tray. 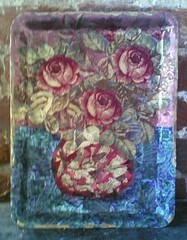 On the front of the tray is a collage of three roses in a vase (Ribbon Roses). I am making both designs with metallic ribbons with various patterns printed on them. Today I went to Red Brick to work on this for an hour. I filled in some of the pink areas, which went fairly quickly, and then worked on the red areas. 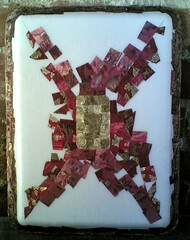 I am only using pieces of ribbon that are red only or red with gold or a little bit of brown or bronze. So I have to look harder for the red pieces. But when it was time to pack up to go home, I was happy with the way the design looks. To be continued. . . . I used my phonecam to take this photo yesterday, around sunset. Boats are launched from this point on the beach. 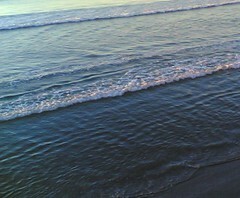 I loved the colors and brightness of the ocean as it reflected the sky, so I took this picture. The color is just as it came out of the camera. All I had to do was to crop the image to get the composition I wanted. 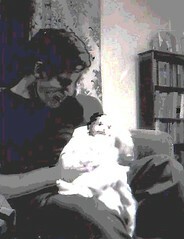 This image began as a snapshot of my father as a new daddy; the baby in the picture is me at one month old. (I found the photo today while looking at some family albums.) In the snapshot, there was too much shadow on my dad's face and too much light on the baby's face (my face), so neither face could be seen clearly. But I liked the content and the composition, so I thought maybe I could salvage the photo. I scanned the image into the computer, but the scanned version was actually a little bit worse in terms of dark and light areas. I adjusted the contrast, adjusted selected areas, sharpened the focus, and even posterized the image in Painter IX. But still, the faces in the photo weren't really visible, one in shadow and one in bright light. I was sad and frustrated that I couldn't solve the problem, until I remembered that I can draw! So I used Painter's digital pastel to draw in the faces (my dad's and my own). I used the original photo as a model, but wasn't really trying for a likeness, just the general idea. Then I re-posterized the two faces, and posterized the whole image again. I like the result, and even though I didn't manage to restore the original photo, I am happy because I made something new from an image of the past. Today I went to Red Brick and worked on the back of this tray. 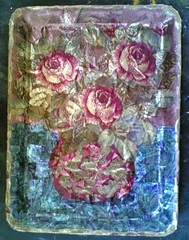 (I made a collaged image of roses on the front of the tray, made out of ribbons printed with metallic patterns.) The base of the piece is a styrofoam tray, from the produce section of the grocery store. I am making a design on the back of the tray, a geometric collage, using the ribbons. The center gold rectangle in the middle is finished. The rest of the design will have two areas filled with pink floral pattern (top and bottom), and two areas filled with red paisley pattern (left and right). Today I worked on establishing clear dividing lines between the red areas and the pink areas. The color shift is subtle, so I used definitively pink and definitively red pieces for contrast. Now the pattern is beginning to appear. . . . In the summer, the best time to go for ice cream is just before sunset. (Here in Massachusetts, there are lots of choices, from the latest new franchise to the old fashioned local stands.) Going for ice cream on a summer evening is a double treat. The ice cream is wonderful, and so is the sky. 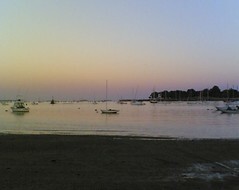 This photo, taken with my phonecam, is a souvenir of a recent evening outing for ice cream. Tonight I cropped the image to get this composition. 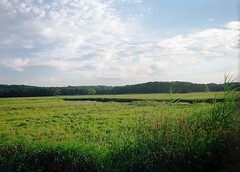 Here is a picture of the salt marsh behind Woodmans, in Ipswich, MA. I took this picture two weeks ago with a disposable camera. I like disposable cameras for traveling and for visitors. I like to get double prints and a CD for e-mailing pictures. Now that I am using my phonecam so much, it takes me longer to get through the roll of film in a disposal camera. By the time I finish the roll and get the pictures back, it is a nice surprise to see what I have! Among the pictures I transferred to the computer today were several taken at Woodman's with friends who were visiting two weeks ago. Woodman's is a popular Massachusetts eatery, where you can get great corn on the cob (my favorite), but it is really famous for Ipswich clams, found in the salt marsh behind the restaurant. It was early evening when we finished eating, and on the way back to the car, I stopped to take this picture of the salt marsh. The disposable camera did a nice job of capturing the amazing colors, so tonight all I needed to do was a bit of rotating and cropping to get a good composition. Some people scoff at my disposable cameras, but I have had good luck with them. I say, it's just the camera that is disposable, not the image. Here is a closeup view of the back of the tray I am working on. 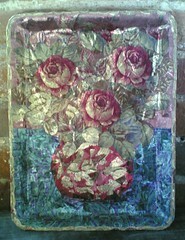 (The collage of ribbon roses is the image on the front of the styrofoam tray.) Now I am creating a design on the back, a gold center and a geometric design with red and pink ribbons. Yesterday I finished the gold rectangular area in the center. I am using fabric ribbons printed with a variety of metallic designs. The gold center is made of pieces of ribbon cut from a red and gold paisley pattern, the same pattern that I used for the vase in the image of ribbon roses on the front of the tray. Yesterday I had fun working with the patterns in the gold ribbon, despite the small scale. 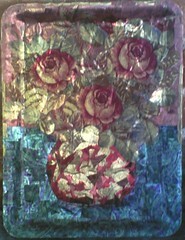 I have been working on a collage of ribbon roses, the base of which is a styrofoam tray. The front of the collage is basically complete, but now I am working on the back and sides of the tray, shown in the photo. For several days, I have been working on the outside edges, using brown and bronze colored pieces. It has been slow going and tedious. But today I decided on a design for the back of the tray, and that made for faster and happier progress. I noticed two "built in" features on the back of the tray that I could use for my design. There is a small rectangular indentation in the center, which Ifilled with gold patterns cut from the printed ribbons I am using. I also noticed very subtle marks extending from the small inner rectangle out to the corners of the tray, making an X on the back of the tray, and dividing it into four pieces, much like the back of an envelope. I decided to use that for my design too. But the marks only show up in strong light, so I drew over them in pencil so I won't lose my place as I work.The top and bottom areas will be filled with a pink floral (crewel) pattern, and the areas to the left and right will be shades of red cut from paisley patterns. I pasted down enough ribbon in both patterns to establish the basic design. I was very happy with the idea and excited to finish. I stayed a bit longer than the hour I planned, but when I caught myself trying to hurry, I decided it was time to stop for the day, because being in a hurry to finish is the most efficient way to ruin a piece like this. But I am eager to get back to this project. . . . This is another of the photographs I took recently. I used my phonecam to take this picture at the beach in Lynn, MA, where I stopped on my way home after a very early morning trip to the airport. This image was cropped out of the original photo. I liked the composition, but I wanted to solve two problems. The first was a distracting mark on the concrete wall, which I was able to fix easily with Painter's digital airbrush. The second problem was that I wanted the park bench to show up, but the photo was too dark in that area. I had tried to use the standard controls to make the photo brighter, but I was losing some of the color in the sky. So still in Painter, I used the select tool and marked off the concrete, the area from the top of the grass to the top of the wall, and was able to lighten the wall so that it was easier to see the bench. Then I increased the color saturation just a bit to make sure I hadn't lost the color of the sunrise and the bright morning light on the lawn. This is an oil bar landscape that I was working on last fall. 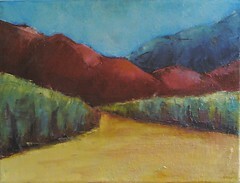 It is a painting from my imagination and from memories of my visit to Colorado last summer. It was nearly finished when I last posted it here, last December. Today I went to the studio and cleaned up some stray marks on the canvas because in a few days, I am going to donate it to Red Brick's upcoming fundraiser. I also sealed the outside edges. 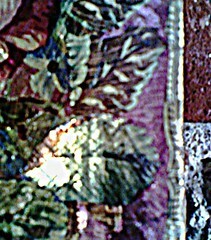 (I used a neutral color that is midway between purple and sage green, colors that you can see in canvas in the foliage.) In the process of sealing the edges, I of course got some new marks on the canvas, so I had to clean those up, too. Now it is on the wall in my studio, but only until the paint is completely dry. I took one last photo to send in for the fundraiser Web site (and also for me). I recently took this photo after an early morning run to the airport. Sometimes I like to take the scenic route home from the airport if I have time, so I can see the ocean as I drive along the coast at Lynn, MA. 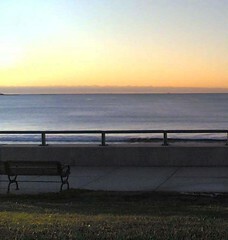 This time, it was a little after sunrise when I reached Lynn, so I stopped to take pictures of the ocean with my phonecam. Tonight I cropped one of the photos to get this image. You can see the color of the water change from light blue (upper left corner) to dark blue (bottom left), and you can see the pink reflections in the foam. It almost looks like fabric, layers of satin with borders of lace. If you liked one birthday rose, here are many, many more! I used the posterized photo (posted yesterday) to create a pattern in Painter IX. I am making a pattern with roses, and this is the second step. I used Painter IX to posterize the photo I posted yesterday. Now it looks like it should be on a birthday cake! Tomorrow, the pattern. To be continued. Today I decided to create another digital pattern, this time with a rose. I looked through my photos to find an image of a rose to use, and I came across a photo that I took over a year ago. 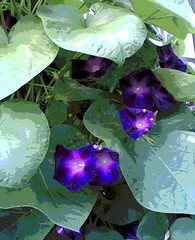 The photo was taken with my late, great phonecam that took soft low-resolution images. 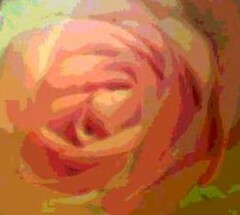 I liked the shapes, and especially liked the colors because this rose is several colors at once (pink, peach, yellow). 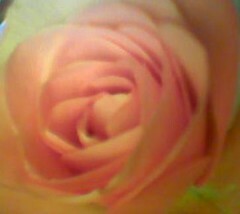 The color defies labeling so I will just call it a rosy rose. Tonight I cropped the photo to get the composition I wanted. So this image is the first step in making the pattern. To be continued. . . 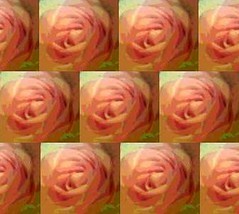 This is the ribbon roses collage, seen from a different angle. I took this photo yesterday after I finished working on the collage at Red Brick. In this view, it is easier to see that this collage is also a tray. 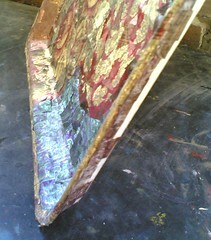 This view also shows the outside edges of the tray, where I have started pasting patterned ribbon over the styrofoam. If this piece is hung on the wall, the outside edges will show. Early this morning, I went to the studio at Red Brick to work on this collage, which is made of patterned ribbon pasted onto a styrofoam tray. I have been making a narrow gold rim around the edges, and today I finally finished putting it all the way around the styrofoam tray. That was the most difficult part of this project, and I am glad to be done with that task! Then I started working on the outside edges of the tray; they are not visible in this photo, but they will be visible when this piece is hung on the wall. To be continued. . .
Today's adventures included a quick trip into Boston to see the Edward Hopper show at the Museum of Fine Art. The museum was great, and the exhibit was terrific! And seeing Boston is something I always enjoy! For today's trip, I was the driver, so I didn't have a chance to take any pictures of Boston along the way. But tonight I found a photo that I took a few years ago along the same route (Massachusetts Avenue). 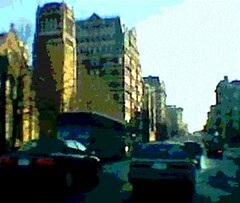 It was taken from the passenger seat, in wintertime, with my first phonecam that took low-res images. I opened the photo in Painter IX and posterized it and used some color overlays; I liked the effect, so here it is. I took this photo tonight during an after-dinner walk at Salem Willows, an interesting old oceanside park with arcades and (indoor) kiddie rides, miniature golf, and a little row of stores where you can sample Chinese food, ice cream, pizza, or fried dough. You can take cruises from there or climb on the rocks or walk along the beach. There were lots of things to photograph (and I did, using my phonecam), but this is the image I like the best, a view of the sky and the ocean at sunset. I didn't have to do much to get this image. The color was perfect. I did a little cropping, and then used Painter IX's digital pastel to clean up a tiny but distracting mark in the water. Today friends are visiting, stopping off on their way to Maine. We drove up to Essex for an early dinner at Woodman's, thinking we might beat the crowd. But it is tourist season, so naturally we stood in line. Nobody minded, because the view was great! 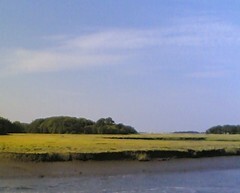 Across the street, I could see the salt marsh and a bit of the river, where the Essex River Cruises were setting out. I wanted to take a photo, but I couldn't get a good view. So I abandoned my companions for a few minutes, crossed the street, and took some quick pictures with my phonecam. I didn't miss much; the line was moving slowly. But the food was worth the wait, and everybody had a great time. Later, back home, I cropped one of the photos to get the composition I wanted; the soft focus (caused by the close-in crop) is a bonus. Recently I posted a photo of the evening sun, cropped from a larger photo. This is the original photo, cropped a bit to set up the composition. When I took the picture, I was interested in the colors in the sky and the play of pink light on the water. I usually try to ignore the fountain in the background because it is a reminder that this pond with all its history is now in the middle of a big office park. But the other evening, seeing the fountain with the pink reflections on the water reminded of hot summer nights growing up when my parents took me to the city park to see a fountain lit from June to August with colored lights. Is it just nostalgia that attracted me to this scene? I think it is more than that. This is a peaceful moment, a rare commodity that is often hard to find in daily life. The fountain is artificial, the pond is in an office park, but the sunset, the light, and the water are genuine. We have to seize those peaceful moments no matter where we find them. Tonight on an early evening walk, I saw some amazing morning glories, with intense purple blossoms peeking out among huge heart-shaped leaves. The blossoms must have opened recently (they weren't there yesterday), and it was a nice surprise to see them, so I took some photos with my phonecam. Back home, I cropped the image to get the composition I wanted. Then I used Painter IX's digital pastel to clean up some distracting marks among the leaves, and posterized the photo to get the image that you see here. 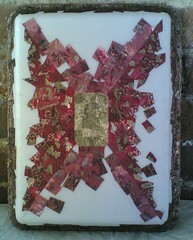 This morning I went to Red Brick and worked on this collage, making the narrow gold border around the edge. At first it was slow and I really had to make myself keep going. This part of the project is very frustrating! At first, none of the pieces of gold ribbon would stick to the styrofoam base. Then I thought I was going to run out of the gold patterned ribbon I am using. I tried some other colors, include a pink-rose color (which I liked and may use more of) but really wanted more of the gold ribbon. Just in time, I found a few more pieces, enough to finish this border. By the time I needed to pack up to go home, I had managed to put a gold rim almost all the way around the edge. Just a little bit more to go. . . I like the way the gold border looks, so now I am glad I didn't give up! This began as a photo taken during a recent evening walk at the Cummings Center Pond. The pond and the scenery are beautiful, and it is a bit cooler walking around the water. 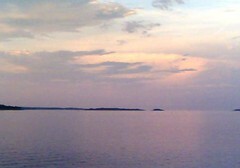 Even better, in the evening, there are nice views of the western sky and its reflections in the water. 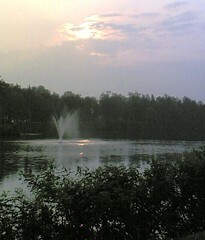 When I was taking photos the other evening, I saw the setting sun, but was really concentrating on the pond itself. 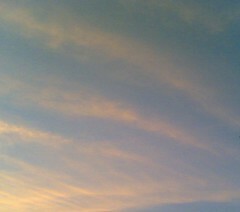 But tonight, looking at the photos again, I noticed the evening sky. 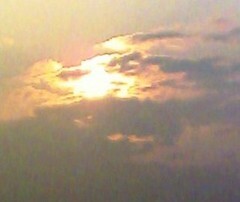 So I cropped the photo to get this image, and adjusted the contrast just a little bit so you can see both sun and clouds. Today I went to Red Brick and worked on this collage for an hour. I am making a narrow gold border around the edge, using pieces of gold ribbon cut from the same patterned ribbons I used to make the image. I am pasting the pieces over the rim of the styrofoam tray (the base of the collage) and down the sides. This is extremely slow and tedious. The little pieces of ribbon won't stick by themselves, but have to be coaxed into place and held down until they begin to adhere. All efforts to hurry backfire, resulting in pieces of ribbon stuck to each other, to the brush, or to me. This is a real exercise in patience, and if anything is the opposite of the experience of flow, then this must be it. Making the image was fun, and covering the back of the tray will be relatively easy. But this is the hardest part of the project. When I began this today, I was getting very frustrated by how long takes (like watching paint dry, or watching glue stick). But this is time I set aside to make art, so it doesn't matter how much I accomplish or what I am working on. (Myself is what I am really working on.) I was hurrying out of habit, but art isn't a race. So I forced myself to continue, and the pieces of gold ribbon began to stick. I also discovered that slightly larger pieces work better, and that made things go a bit faster. (Later I also heard that the humidity was extremely high today, and that probably didn't help.) When it was almost time to go home, I began to see some progress. To be continued. . . . It has been very hot for the past few days, but the temperature dropped today, so the day began with fog and mist. Here is an image to match the day. In fact, I took this photo several weeks ago, during another cool spell. 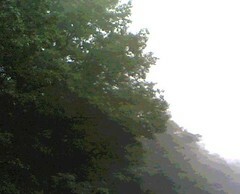 I like the look of summer fog, with the soft green of the trees fading into gray against the white sky. Tonight I cropped the photo and posterized it in Painter IX. 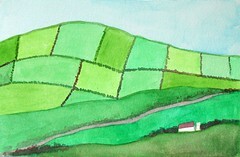 This is a small watercolor (approximately 5 x 7 inches); I painted it in Belfast after a road trip in Ireland. This painting is not from observation, but I did a lot of looking during my travels, and this was inspired by the countryside there. I was glad that I had packed my little portable watercolor kit, and I had fun painting this whimsical little scene. Today I photographed this painting because I am planning to take it up to my studio this week. This image started with a photo that I took this time last year on a very quick trip to Colorado for my high school reunion. I made the most of the few days I had, and drove between Denver, Colorado Springs, and Pueblo so I could visit with family and friends on the way. 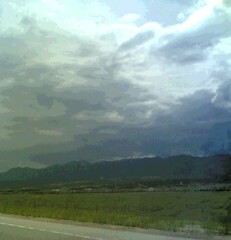 Because I was in the driver's seat, I didn't get many pictures of the great Colorado scenery up and down the Front Range. But at one point, I got stuck in a traffic jam around Colorado Springs, and despite worrying that I would be late to the reunion, I still saw the delay as a photo op. I got out my disposable camera and took a picture of the mountains just as clouds rolled in for the traditional afternoon thunderstorm. And then the traffic started to move again. (And yes, I did make it to the reunion and had a great time!) Later, when the trip was over and I got the film developed, I saw that reflections from the car window were visible in the image and were too distracting, so I never did anything with the photo. Recently I came across the photo again, and decided to try to salvage the image because I liked the composition and the colors. So I opened the image in Painter IX and did some gentle posterizing as well as repair work with digital pastel. (I left some of the reflections in the image because they seemed to add to the composition.) Now I have another souvenir. I am glad I took the trip, and glad I took the picture! It's been too hot here for a walk during the day. Last night I took this photo with my cell phone camera during an evening walk near the beach at Independence Park, where it was cooler. I liked the effect of the evening light: the shore was in shadow but there was still bright light out on the water. 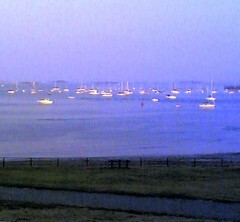 The ocean was purple and blue, and the boats were glowing with reflected light from the western sky. Today I cropped the photo to get this composition. Here is a detail view of the edge of my ribbon roses collage that I posted yesterday. 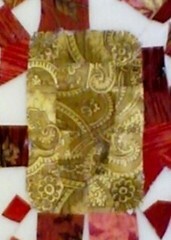 I took a closeup of the narrow gold border that I am creating, using pieces of gold pattern cut from the ribbons that I used to make the rest of the collage. If you look hard, you might be able to see the tiny design in the gold border. I am pasting these little pieces of gold ribbon around the rim of the styrofoam tray (the base of the collage), to create a frame for the image and to hide the raw styrofoam edge. Early this morning, I went to Red Brick to try out my idea for finishing the rim of the collage with a narrow gold border. I had considered using gold stickers, but a mistake putting them down might cost me the whole image. And the bright gold of the stickers would overpower the gentle gold woven into these ribbons. So instead I am making the narrow gold border with the ribbon itself. I look for gold in several of the patterns in the ribbons, and cut out little triangles. (For some reason, triangles work best). Then I paste them down, or try to, with gel medium. I am wrapping the narrow end of the triangle around the back and over the rim of the styrofoam tray, and it takes patience to make the triangles stick. Hurrying works against you; wet medium sticks to wet, so these have to be pasted down one at a time. As I began, I thought this idea wouldn't work at all; then the triangles started to stay down, but the process seemed endless and I thought it was taking too long. But finally I began to like the result, and decided that after all, the image is worth the trouble. (The beginnings of the gold border are visible in this photo, but tomorrow I will post a closer view.) It will take a couple of hours to paste the gold edge down, so what! But then finishing the back of the tray will go much faster. As I worked, I grew calmer. It was like a meditation, and my impatience disappeared as I concentrated on the task. Soon it was time to pack up and go home. I managed to get most of the glue off my hands before I left the studio. I had little pieces of gold ribbon stuck to my clothes and hair for at least the next hour, when I had a chance to get changed. But the smile on my face lasted all day.